We have gained immense expertise in providing our customers with an assortment of Printed Milk Packaging Film. Our offered milk film is an unique blend of polymer, which can even sustain in high speed FFS packaging machine. Our offered range can be used in packing food items for consumption hence, we develop these hygienically. These Milk Films are specifically designed as per the clients specifications. 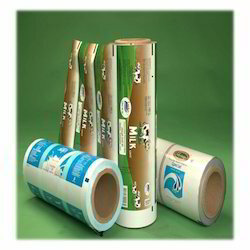 The films are available in different roll sizes to enable packaging of milk and water in different capacities. Further, the printing on the films are bright and clear to ensure clear visibility of the specifications of the milk. We are reckoned as the major entity engaged in developing premium grade Milk Packaging Film. 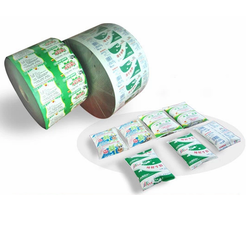 We are offering Milk Packaging Film. We are a unique name in the market to provide our honorable customers an exclusive range of Milk Packaging film. With a firm commitment to quality, our organization is involved in offering a wide ambit of Milk Packaging Film. NOTE: Prices may changes as per the material and capacity. we are manufacturing butter milk film for butter milk pouch packing. We have emerged as a noticeable firm intricate in making available Milk Packaging Film, which is designed using advanced techniques.